Hops and hatchets -- what could go wrong? 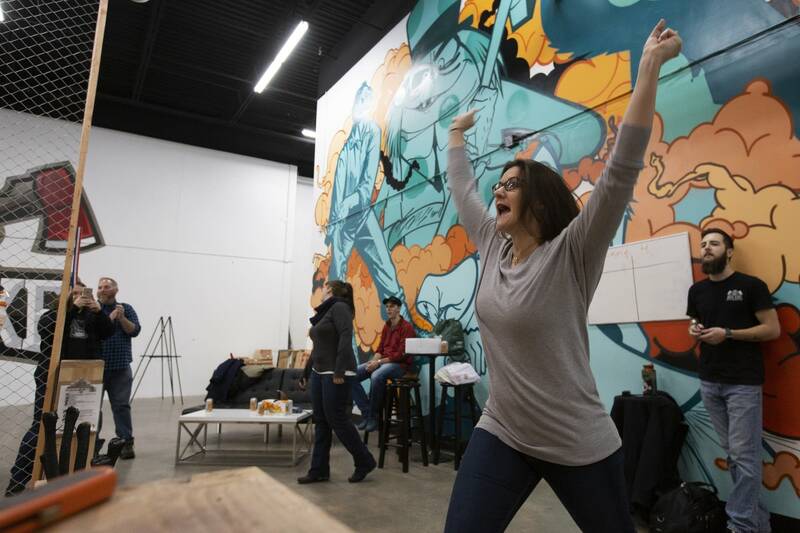 The Minneapolis City Council granted a license to serve strong beer and wine to a place where people throw axes at large wooden targets. 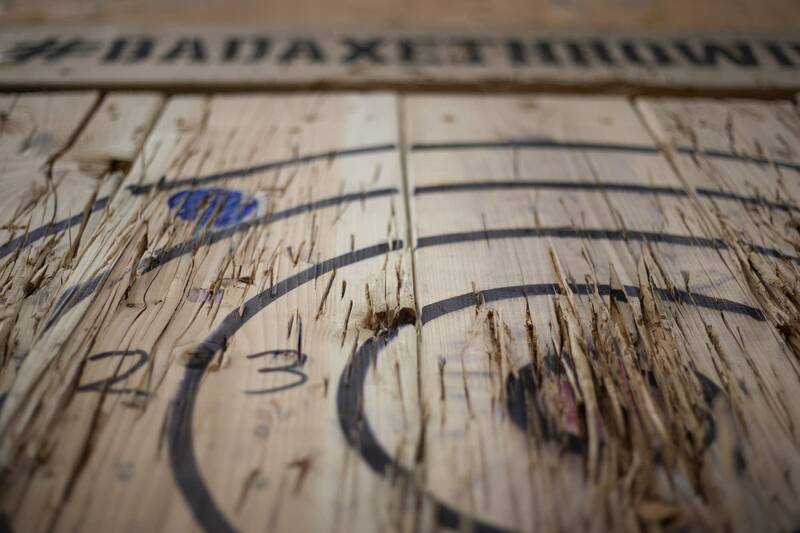 Don't worry, said Bad Axe Throwing site manager Phillip Dahlager — the club will have a three-drink limit and the staff is well trained. And the franchise, which has 21 locations in the United States and Canada, has allowed strong drink in other clubs for a while now. "This company has been in business for four-plus years," said Dahlager. "The worst reported injury was a really bad splinter." 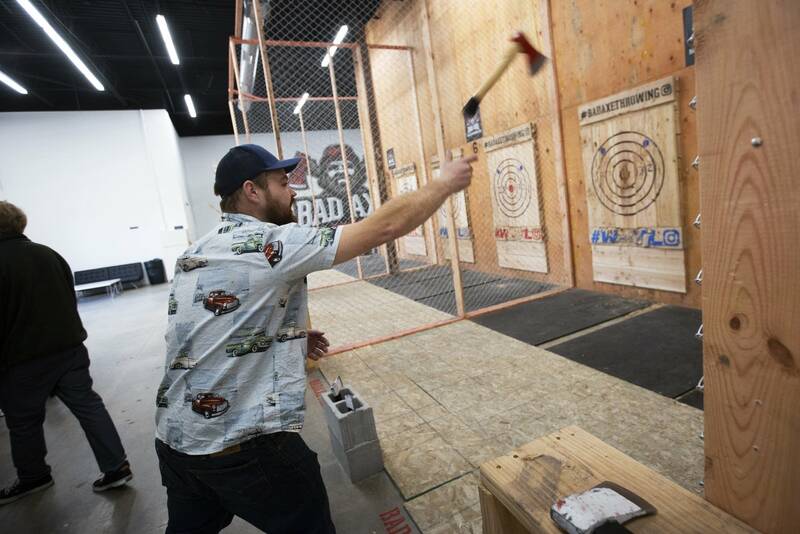 Bad Axe Throwing's Minneapolis site opened in the spring and is located in a warehouse the size of a small airplane hangar. The cavernous room echoes with the sound of hand axes striking large wooden targets. Multiple lanes contain two targets each, so people can throw side by side. Each lane is separated by chain link fencing. There are several types of axes to choose from. 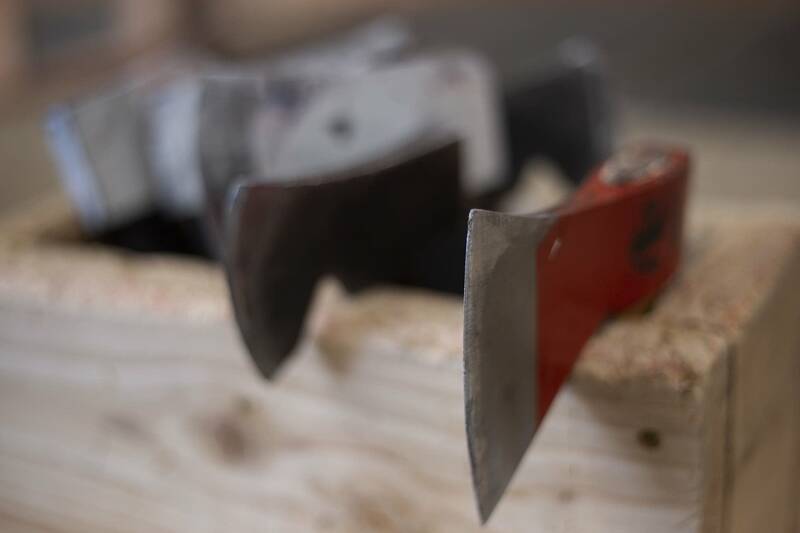 "We have all different kinds of sizes and weights of axes, it helps us customize the experience for the customer," said Dahlager. Picking an ax is a little like picking a ball at a bowling alley, except there are more variations. Some can be easily held and thrown with one hand. Others have longer handles which lend themselves to a two-handed grip. Dahlager, with a lumberjack-esque beehive beard and stature, holds up a couple axes to demonstrate the differences between them. "Each person has their own favorite kind of ax," said Dahlager. "Mine is our Estwing. It's the largest, heaviest ax that we carry. As you can tell, I'm a big guy. So, big ax, big guy. Kind of works out." Dahlager holds the Estwing over his head and hurls it at the target, just missing the bullseye. An enthusiast who's been hurling hatchets for more than a decade, Dahlager can perform trick shots. At one point, he throws two axes at once, one in each hand. Though he's right-handed, the ax he throws with his left sinks into the red dot at the center of the target. The game is like darts. The closer you are to the middle, the more points you get. However, a player can score the most points by hitting one of two blue dots on the upper outer edges of the target. The trade-off is that dots are so close to the edge, if a player misses, they get no points. New customers get coached by employees like Shane Donner, who begins with a few important safety tips. "When we are throwing, we are able to have two people throwing at once," said Donner to a group who had come to celebrate a birthday. "Make sure no one is down lane of you when you go to throw." 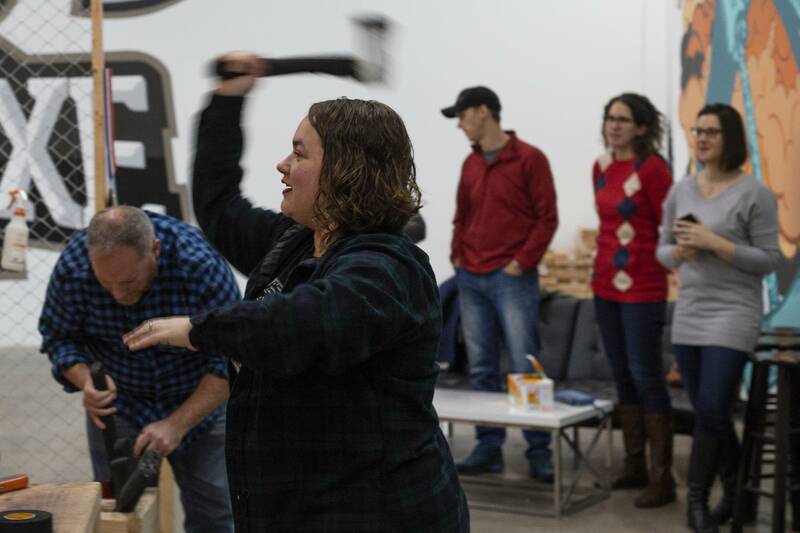 The birthday guest of honor, Angela Sylvester, had never been to an ax-throwing range before. It took several tries before she got the ax to stick in the target. The group brought with them a few 12-packs of LaCroix sparkling water. Sylvester said having beer and wine available is a good idea, especially if one of the people you're with doesn't want to chuck hatchets and won't be content to sit and sip fizzy water. Sylvester joked there may be other potential advantages. "That might balance you out, if you're throwing with one hand and you have a beer in the other hand," she said. "Also I feel like the way this place is set up is that it feels really safe. So, it seems unlikely that that is going to be a terrible problem." 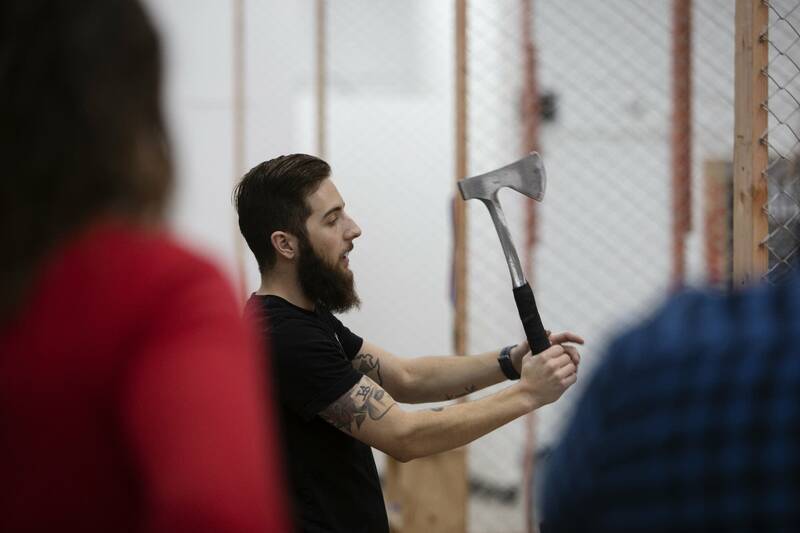 The sound of steel axes splitting wooden targets will soon be accompanied by the clamor of construction as the company builds a bar on the premises. Company officials say they'll be ready to start serving alcohol in four to six weeks. Correction (Nov. 20, 2018): An earlier photo caption in this story misspelled Shane Donner's name.